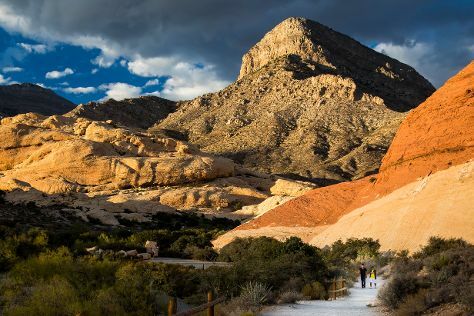 Get in touch with nature at Red Rock Canyon National Conservation Area and Valley of Fire State Park. The Mob Museum and The Strip are good opportunities to explore the local culture. Explore the numerous day-trip ideas around Las Vegas: Clark County Heritage Museum (in Henderson), Boulder City (Boulder City/Hoover Dam Museum & Hoover Dam) and Willow Beach (in Fort Mohave). Spend the 16th (Sun) riding across the waves with a waterskiing or jet-skiing adventure. There's lots more to do: see the interesting displays at The Neon Museum, take in nature's colorful creations at Bellagio Conservatory & Botanical Gardens, ponder the design of Bellagio Fountains, and try to win big at Bellagio Hotel and Casino. To see reviews, other places to visit, and tourist information, you can read our Las Vegas trip itinerary builder . In June, plan for daily highs up to 103°F, and evening lows to 77°F. Cap off your sightseeing on the 17th (Mon) early enough to travel back home.